Lately in our house, the talk has been all about our son. Specifically, when he will come, how he will enter this world, what that day will look like, etc. We found out last week that our perfectly healthy little guy is not so little. 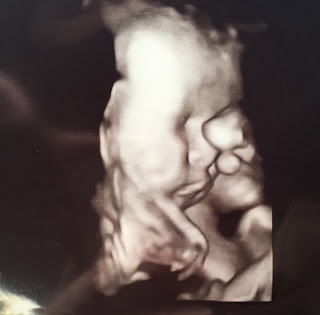 At just 34 weeks, he is already 6 lb 8 oz and in the 92nd percentile! His head and abdomen are both measuring 3 full weeks ahead too! We aren't really expecting to make it to my due date, and if by chance I do, he will likely be so big that a c-section will be our only option. As long as he arrives safely and healthy, I am happy with whatever the doctors decide. God has a plan, and we are confident he will deliver our big guy safely. Like I said, we talk a lot about how big he is. We are very proud of this fact! We've been on the other end of the spectrum, and it's heartbreaking. I remember like it was yesterday going in for an ultrasound at 16 weeks with Taylor Grace and being told how small she is. Her head was in the 20th percentile, her abdomen was in the 5th percentile, and her femur was in the 3rd percentile. She was measuring a full 2 weeks behind and so, so small. We loved her so much, but all I wanted in those weeks was for her to grow and to miraculously be healed. If you've been around this blog, you know that she didn't grow and wasn't healed on earth but instead in Heaven. I laid in bed the other day thinking about just how redemptive our God is. Our journey to become parents began in 2014 with our precious, tiny daughter. Almost 3 years later, we are getting ready to meet our big, healthy son. God took the grief we had with Taylor and used it to show us how truly blessed we are to be having such a big baby. Technically, our son is considered a "rainbow baby": a baby born after miscarriage or infant loss. You won't really hear me using this term because there is a part of it that just doesn't sit right with me. A rainbow baby is the hope and joy that follows a storm. While our son is that hope and joy, I can't really bring myself to think of our journey with Taylor as a storm because I am so, so thankful she was created. I loved her so much and am still so grateful God let me be her mom. What I see when I look at our journey to parenthood- from losing Taylor in 2014 to preparing to meet our son in 2017- is God's faithfulness. He redeemed what was broken and turned our mourning into dancing. Today, I am simply thankful. I'm thankful for the journey. I'm so thankful for both of my children. I'm thankful for a God who is redemptive. I was told my daughter was 6 lbs 11 ounces at 37 weeks...and she was born at 41 weeks at just 6 lbs 6 ounces. Listen to your doctors, but know that those measurements can be off! Reading this makes me smile, I am so so excited for you guys. Your little boy is so very lucky to have you as his parents. This hits close to home with my mama just losing her 12th baby at 9 months 1 week gestation. It was so incredibly painful and hard but Jesus has done so many beautiful things through it. Life is always a gift and I'm so grateful for the way God is working in your sweet family! Amen. You two are going to be great parents. PK Domain offers Best quality web hosting, domain registration, website builder and reseller hosting with free domain registration in Pakistan. PK Domain offers Web Hosting in Pakistan, One of top quality Web Hosting Services Provider in Lahore Pakistan. Our services are available in all cities of Pakistan you can order us via www.pkdomain.com.pk. PK Domain is one of top best web hosting provider in Pakistan along with big cities, Karachi Lahore, Islamabad.